“This is the place to go! Hands down! We’ve been going to this office for a couple years now and couldn’t be happier with the experience. The staff is all super efficient and friendly. The design of the building is unbeatable. Who else can say they go to a lodge every time they get their teeth cleaned? 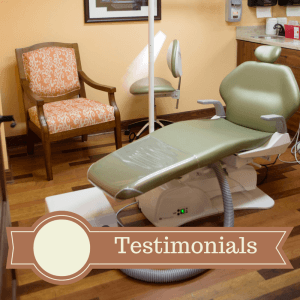 Can’t recommend this place enough!” –Sarah K.
“I love my dentist office!!! The staff is very nice and professional. I would recommend them to everyone. I feel they are taking really good care of me and I love how knowledgeable they are.” –Lisa M.
“I loved the beautiful and relaxing environment, friendliness of the staff, and the time they took to explain the care I would be receiving. They made what many consider an unpleasant experience as lovely as possible. I especially liked that they took very clear, enlarged photos of the teeth that needed care. It helped me to objectively see the damage and not have to just trust their opinion. By far the best dentist visit I’ve ever had. And they had free coffee and cookies.” –Rachel G.
“My first two visits were great! Aesthetically pleasing from the inside out, but more importantly, the entire staff is friendly, welcoming, and accommodating. The environment is stress-free and warming the entire visit. So glad that I chose this dentist office after moving to Raleigh.” –Tiahna G.
“I am 63 years old. I’ve been to lots of dental offices in my years. Many different dentists, many different assistants, office staff, and so on. I always know I will be treated with respect at CVD! My concerns are always heard and between all of us there we come out with a great decision on my treatment.” –Tim H.
“My husband and I love Crabtree Valley Dental. They are amazing!!! The staff made me feel so very comfortable and calm. They did an amazing job. Thank you so much! 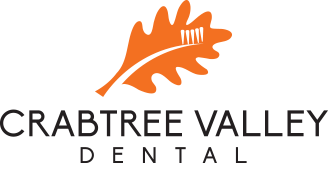 Crabtree Valley Dental is the best in North Carolina. Your whole team is awesome! Thank you again.” –Cynthia B. “Today was my family’s first visit! From the front desk to the hygienist, to the assistant to the staff we passed in the hallway, everyone was friendly. When we walked through the front door our first names were displayed as new patients. They took their time to make sure that we understood everything. They cared about what was important to us. They even asked how we would rate our smile. We have found a dental home!” –Donya E.
“This dental team is awesome. My wife was super anxious to have an emergency procedure, but from the moment you walk in the door, there is a warm, inviting staff ready to put you at ease. I don’t remember experiencing such care and professionalism wrapped together. Thank you for your excellent care for my sweetheart. Highly, highly recommend this clinic. We’ll be back!” –David W.
“The staff was very welcoming. I thought it was a nice touch how they gave me, a first timer, a tour. Also, the exam room had a dental goody bag waiting for me and the “Welcome” with my name on the computer screen was an AWESOME touch to make me feel comfortable and appreciated. The x-ray tech, Angela, and Dr. Joy were very personable and explained everything in detail. I hope all my visits will be like that.” –Tee Y. “Every person who works here is so friendly and nice. I have anxiety and told them that. And they were so reassuring and nice. I wasn’t anxious at all! The building is so nice and clean! They also have a little area for drinks (coﬀee, water, etc.). I will be coming here from now on! Wonderful!”-Lisa S.
“Great staﬀ and dentists! From the minute you walk through the door until you walk out you’re treated with kindness and respect. I would highly recommend!” -Morgan B.